Discussion This plugin is needed on this forum asap!! This plugin is needed on this forum asap!! This discussion is related to the Users Vanilla Version addon. @Todd @Lincoln , this would be extremely helpful , you know , with the millions of versions out there!! , all jokes aside... this would serve this forum extremely well. If I can I would like to nominate this plugin to be used here as soon as possible Please !! When it is their first ever post in which they never state their version or input their version in their profile settings in the first place, then we would have to tell them to go to their edit profile page; however, this will help people avoid getting asked for their version more than once if they forget to state it when necessary. Another solution would be to have a field or text reminders on the new discussion page for them to input their version number if needed. Yes I remember everyone's version once they state it, but others don't and it gets tiresome to ask over and over . It should be mandatory to fill that in maybe from registration, I mean this is a support forum for this software and it would really help everyone, the user who need help and the helper. Sounds like a good idea to have a required field on the new discussion page for the version as some people use more than one version for production, testing, or their clients, and also with an "N/A" option as well since not all discussions need to state the version. It helps identify user groups, not including the multi version users, might be a good way to gain some idea of actual users of what version. At leads for those who come in. As a statistic value of some kind. My plugin was kind of a joke made just for an exercise. If you consider questioning this information from the user when he asks, then you have to consider that the forum is also a reference for anybody who searches for already answered questions. So every question must contain the historical version number. 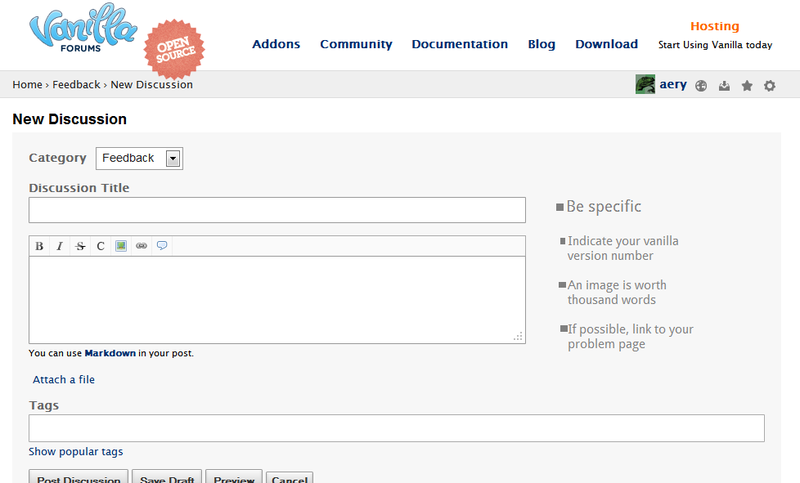 Problem 1: a user might change the version info in his profile. If the version number is shown from there, it will always and everywhere show only the current version info. That is misleading. Problem 2: there are often users who use an existing discussion for posting a "Help, I've got the same problem, too" and you'd have to store their version info, too, if you want to keep the reference character of the forum. I'd put a colored banner reminding the author to specify his vanilla version right above the discussion body in the new discussion view. This is exactly my point. Even if I know @CharliePratt uses 2.0.18.8, other people won't in a year. Heck, I might not even remember in a week. I think that once a version is entered it is a permanent record and you can only add to the field. Or check the box with your version type of thing. And a tooltip showing them where to find it. Then that box once checked can't be unchecked. As you choose versions. I mean we are talking about small numbers here not millions of versions. 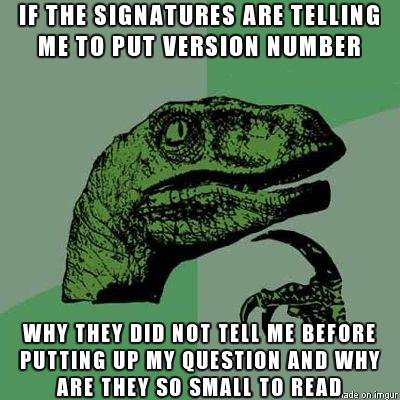 It could be a multiple choice to check the version being used...somewhere it must be mandatory. The version can work as another part of the user profile info. At least going to their page would show what version if it did not appear next to their avatar in a discussion. It must be mandatory to have a version of some kind. Until the issue is no longer. Having it in the new discussion page should be at the very least , like shadowdare said. There will be a point where it won't matter everyone will have upgraded to 2.2 and the variations will be slight as compared to the transition now. I think if you ask a question - you are starting a discussion. so you "own" that discussion and it relates to your version. me too questions (should usually start another discussion, especially if it is a different vanilla version or at least post their version #) otherwise it is assumed they have the same version as the OP. To me displaying version numbers in any comment is confusing and should not be shown. If you are replying to a discussion, one would hope you read the OP's post and therefore you would see the version #. putting it in the profile for historical reasons will just lead to more inaccurate useless data, and making it mandatory upon starting a new discussion is the way to go. 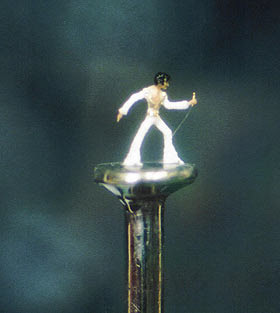 But, of course - this is all a moot point if Todd or Lincoln or the powers to be don't see this as a need, because we would then be discussing how many angels can you fit on the top of a pin, which although good for debate, doesn't actually provide anything tangible. Yes that should be in red letters , it would be a start and does not require much effort to add text to the form. Good idea aery ! How many? I would say none, coz there is no such thing right ??!!! I get it now! Aery. obviously they don't read my signature, hgtonights signature, underdogs signature and vrjvlinder's signature which all have something related that would stop the ad-nauseum questions and replies related to missing information, and how to solve one thing or another. My point being - Users are stupid. They will never understand the importance of version numbers or searching first. So, they need to be reminded just before they are about to commit stupidity. so your point is exactly what i said in the first line, as Vrjivlinder would say "no?" and an error message "before you are about to commit stupidity"
I think the version on the profile is enough and they should have it on their title. For purposes of continuity. Maybe there is a way for old posts not to be updated with the new version they might use in the future so as to keep the content accurate. That might be the caveat. I think that if the requirement for the version is written in big red letters by the text field, it increases the odds for compliance. I've got a pin right here in front of me and i see 30 maybe 31 angels. I don't know how many more could stand on it, without damaging a wing. But i I be there is room for a couple more at the very least. since nobody reads my links in my signature and some even think it is spam...maybe I will just post this pic every time, maybe you should too.